Join Thomas Jefferson Foundation president Leslie Greene Bowman and Jefferson scholar and author Clay Jenkinson in exploring the less-traveled reaches of the Lewis & Clark Trail in Montana and Idaho. On this exclusive adventure, we hike, canoe, swim, sing, tell stories, explore historic sites, gaze at the stars, sit around bonfires, and learn about the most important exploration party in American history. We'll spend three days on the magnificent White Cliffs section of the Missouri River, then a night in a wonderful historic hotel in Fort Benton, followed by four days on the Lolo Trail in the exact footsteps of Lewis & Clark, on the most pristine portion of the entire national Lewis & Clark Trail. No struggling with tent set-up or camp stoves on this trip. Our experienced outfitter ensures you will be greeted at the end of an adventurous day by a comfortable tent site, a cold drink, and hearty hors d'oeuvres, followed by dinner on a tablecloth in the wilderness. Your tour begins in Great Falls, MT, and ends in Missoula - a mildly strenuous week of historical commentary, interpretation, wit, storytelling, and discussion of the meaning of American wilderness with nationally- acclaimed Jefferson and Lewis & Clark scholar Clay S. Jenkinson. The tour includes an evening with Meriwether Lewis himself, guide services by the finest Montana and Idaho outfitters, equipment for four nights of camping and canoeing, all activities, lodging, meals, transport, museum and USFS fees, state and local taxes, and gratuities. Airfare is not included. Cost: $4,995 per person, based on double occupancy. Single supplement of $1,000 if you prefer a room - or a tent - of your own. Join award-winning historian, humanities scholar, and Meriwether Lewis biographer Clay Jenkinson on this exclusive cultural tour in the heart of the Lewis & Clark Trail, available only to Monticello supporters. You can find the full description below. Arrival at Great Falls. Orientation. A visit to the Great Falls of the Missouri River. An evening with Captain Meriwether Lewis. Sleep in bed. First day on the river. We embark at Coal Bank Landing. A blissfully easy paddle to Eagle Camp. A hike up Slot Canyon. Catered camping under the stars of Montana. Sleep in tent. Full day in canoes. Lunch at the famous Hole-in-the-Wall. We bob down the river to Slaughter Camp. Sleep in tent. Final day on the river. We disembark at Judith Landing. A bus to the Grand Union Hotel in historic Fort Benton. Hot showers, laundry, regrouping, and live music on the hotel terrace. Sleep in bed. A coach ride to Missoula and on to Lochsa Lodge in the heart of the Bitterroot Mountains. The best lodge in the American West. Sangria, huckleberry dressing, and great wilderness food. Sleep in bed. The Wendover March, 8.5 miles up the mountain to Snow Camp, precisely where Lewis and Clark camped in September 1805. Sleep in tent. We visit the best historic Lewis & Clark sites in Idaho. Short hikes. Group meditation at Smoking Place. Dinner at Dry Camp and the sunset on Bald Mountain. Much campfire music. Sleep in tent. Down the mountain to the Lochsa River. The most refreshing swim of your life. Dinner at Lochsa Lodge. Sleep in bed. A day of rest and leisure. A guest lecture in the a.m. and the rest of the day for reading, napping, talking, drinking, or soaking up the Rocky Mountain West. Sleep in bed. Join our annual adventure through the magnificent White Cliffs section of the Missouri River, followed by the most pristine portion of the entire Lewis & Clark trail—in the Bitterroot Mountains west of Missoula, MT. Participants must be in good physical shape to participate. For those who do not wish to engage in the more strenuous activities, vans will be available with alternative delights, and we will all meet up for dinner. The accommodations are perfect. Our favorite outfitter, Wayne Fairchild, and his crew move ahead of us, set up the camp, prepare the appetizers, make sure the beer is cold. On the four camping nights, two on the Missouri, two in the Bitterroots, your tent is set up before you arrive, with your preferred mattress or cot. Bring your own sleeping bag or ask us to provide you one at modest expense. The food is delicious. Fresh ingredients, a cheerful and delightful kitchen crew, excellent hors d’oeuvres. For those with special food needs, we can make arrangements. Welcome to Great Falls, Montana! Settle in, then gather in late afternoon for a welcome reception hosted by Lewis & Clark scholar Clay S. Jenkinson. Clay is with us through the entire adventure. After a quick orientation meeting with our Missouri River outfitter, we will depart for the Great Falls (named by Meriwether Lewis) at Ryan Dam on the Missouri. The dam and its unique spillway are more beautiful than you might think. At the falls enjoy an early-evening encounter with Captain Lewis as he explains what his patron Thomas Jefferson had in mind for the journey, and how what eventually became Montana filled Lewis with such a sense of enchantment that he found it impossible to write a journal entry equal to the spirit of the place. Today our journey takes us to our launching point at the portal of the most beautiful segment of what Lewis called “the mighty and heretofore deemed endless Missouri River.” First, we’ll stop at “Decision Point” at the confluence of the Marias and the Missouri Rivers. When the expedition arrived here in early June 1805, nobody was quite sure which of the two streams was the Missouri. The captains rightly chose the right branch, but everyone else, including the trailsman George Drouillard, believed the Marias was the proper stream to ascend. This is one of the great photo ops of the Lewis & Clark Trail. As with most of our stops, Clay will provide a historical but often comic riff about burdens of discovery here. 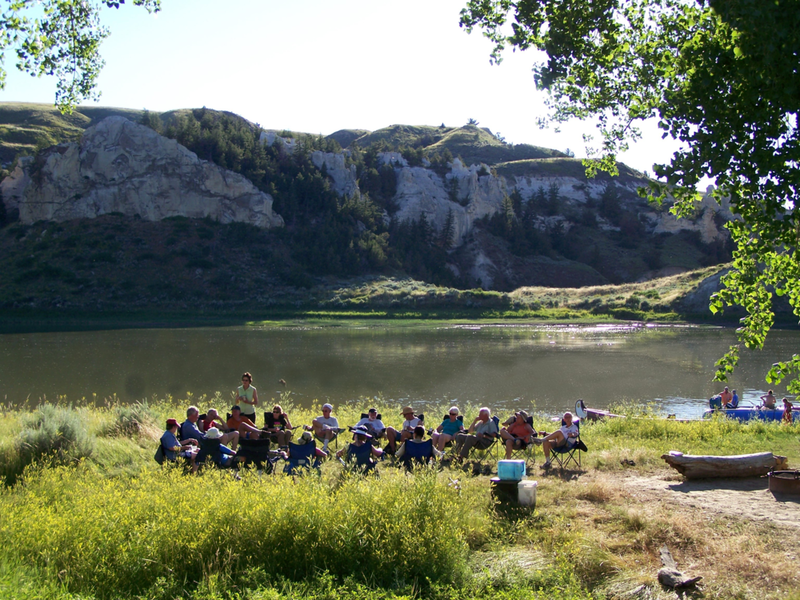 The launch of our three-day canoe adventure begins at Coal Banks Landing, east of historic Fort Benton, MT. In the next couple of days, you will have plenty of opportunity to hike through some beautiful landscapes along the Missouri River. Some offer petroglyphs, others teepee rings on bluffs high above the river. While our guides prepare dinner, our outfitter Wayne will take us through the intricate Slot Canyon. In a side canyon invisible from the river, wind and water have carved a beautiful white sandstone labyrinth, full of delightful surprises, on a route just strenuous enough to prepare us all for the fabled Wendover March. Back at camp, set precisely where Lewis & Clark overnighted two hundred years ago, hors d’oeuvres, wine, and cold beer await, followed by an excellent meal served over tablecloths and actual dishes. As always, an informal evening discussion with Clay. Coffee at dawn, a hot camp breakfast at 8:30, and now the real adventure begins. In the morning light, you’ll notice that Eagle Camp—just across from a famous igneous plug named La Barge—is the gateway to the famous White Cliffs section of the Missouri River, accessible only by water. The buffalo are gone now, but in almost every other way you will be gliding quietly through the river as Lewis & Clark witnessed it (but downhill!). 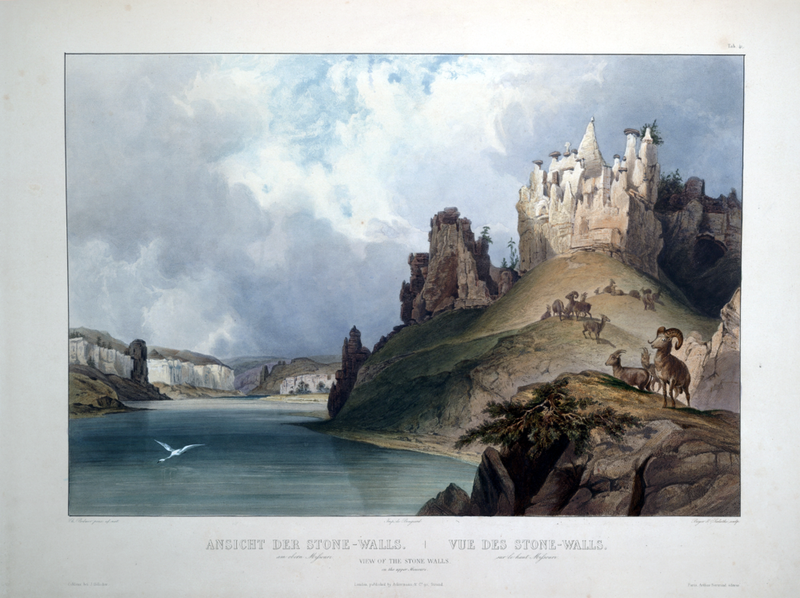 Five minutes after we start the day’s float, Clay will ask you to turn your canoe around to observe the Stone Gates, painted by the Swiss artist Karl Bodmer in 1833. As you take your photograph of the sublime formations, you suddenly realize that we camped last night in Bodmer’s famous painting. The rest of the day takes us past beautiful hoodoos, igneous dikes, sandstone formations in which Native Americans found spiritual messaging, and other spectacular formations that led even the rationalist Meriwether Lewis to speak of “scenes of visionary enchantment.” As Jefferson said of the Natural Bridge in Virginia, “It is worth a trip across the Atlantic to see this object.” After lunch under a lone cottonwood tree at the base of the one of the river’s most recognizable landmarks, the Hole-in-the-Wall rock formation, we’ll work off our restless energy by climbing up to the summit, where you can be photographed standing in the Hole-in-the-Wall itself (or plummeting like Icarus into the Missouri if you prefer!). This is one of the great hikes on the Lewis & Clark Trail, forty minutes up and then fifteen down. There is no way to explain the grandeur to behold here. You have to earn it with your feet. After another leisurely float, those who wish it bob down the last mile to camp in their life jackets, feeling the gentle but inexorable tug of one of the world’s great rivers. It’s a perfect way to cool off on a hot dry July afternoon and experience geomorphology at the molecular level! In the evening, another fine meal, great conversation, and, if we are lucky, a thunderstorm. Our last day on the Missouri River. After breakfast and a leisurely paddle of 12 miles, we disembark at Judith Landing. Here the stream William Clark named for his future wife Julia (Judith) Hancock flows sweetly into the Missouri. The American Prairie Reserve, dedicated to creating a vast buffalo commons and grassland park in the American West, has recently purchased the PN ranch at the mouth of the Judith. Over lunch, Clay will discuss the near-extermination of the bison in the 19th century, and the painstaking work undertaken by the Smithsonian’s William Hornaday and his new friend Theodore Roosevelt to save and restore the species. We leave the canoe portion of our adventure just as the river enters a wider, sagebrush region known as “the Breaks of the Missouri.” By mid-afternoon, we’ll get you to a hot shower at a historic hotel—with laundry, grocery, and hardware services nearby—and time to retire your river gear as we prepare for the second half of our journey. In the evening live music on the hotel terrace, and fine dining in the Grand Union Hotel, Montana’s oldest, built in 1882, seven years before Montana became a state. Shower as many times as you want. This is what is known on the Chautauqua circuit as “jump day.” After breakfast in the hotel dining room, we’ll take an air-conditioned trail coach through some of the most beautiful country in western Montana. Our destination is the whimsical Lochsa Lodge, just over the border in the Bitterroot Mountains. This is Clay’s favorite resort in America—just enough frills to be satisfying, just enough of the rustic to be authentic. Great food, a wide variety of drink, and the unbelievably beautiful Lochsa River five minutes by foot from your cabin. The Lochsa is almost the platonic idea of a clear mountain stream. We often spend the late afternoon sitting in the river talking, sipping beer, trying—as always—to walk across it without tumbling in among the trout. On the coach journey we’ll eat (and resupply) in Missoula, where there is an REI co-op, and then drive over Lolo Pass into Idaho. Eat and rest well, friends, for tomorrow we must make our historic ascent up to Wendover Ridge. For those who prefer not to undertake the notorious march, we offer a satisfying alternative: a fishing weir known to Lewis & Clark, the expedition’s 12 Mile Camp, and Rocky Point Lookout, now decommissioned by the Forest Service, but available for overnight lodging next time you come to the Bitterroots. This is the day of days on Clay’s Lewis & Clark Adventure Tour. When Captain Lewis discovered that the Shoshone guide “Old Toby” had led the expedition astray, he ordered his company to make its way from the Lochsa Valley up the mountains to the Nez Perce Trail straight up. One of our loudest customers, years ago, was heard screaming at mile four, “Didn’t those morons understand @#!&$#@ switchbacks? !” Our eight-and-a-half mile uphill hike (a 3000-foot climb in elevation) follows the expedition’s September 15, 1805, ascent through slushy snow over treacherous terrain. They were leading pack horses. We carry nothing more than water bottles and energy bars! Here, more than anywhere else on the nationwide Lewis & Clark Trail, you can be sure you are walking precisely in the footsteps of America’s most famous explorers. You can make the hike at your own pace. With luck, we will be led by the infamous Chad Jones (Clay’s friend the “tree dork”), a wilderness guide who combines Herculean stamina with pathetic comic shtick. Nobody who has begun the Wendover March has ever failed to make it to the top. In a sad historical note, Russ Eagle, who briefly held the record ascent of three hours and one minute (what he calls “three naught one”—he’s from North Carolina), has recently relinquished the world record to the Iron Man master Mike Harry of Franklin, TN, the site of “the last great battle of the Civil War” (hereafter LGBCW). In spite of Clay’s drama-queen exaggerations about the Wendover March, this day is tremendous fun, and those who make the hike are filled with the pure joy of living the “strenuous life,” as Theodore Roosevelt put it. Tonight’s camp, (another historic L&C campsite), is aptly named Snowbank. They melted snow here for drinking water. It is on this evening when our participants look around the camp circle to discover that we have become what Lewis called “the best of families.” Whatever shyness or urban tension you bring to the trip will have slipped away somewhere at mile five, and you will realize that you have discovered your soul again, and the joy of your body, the magic of the wilderness, and the esprit de corps that comes from relinquishing our tightly-wound social identities. This trip changes lives. It renews lives. It renews relationships, and creates some new ones, too. Just wait: you’ll see. Today we wander west on the Lolo (Nez Perce) Trail. Our transport is minivans, but we stop half a dozen times during the day to look at Lewis & Clark historic sites. We are now in the heart of the heart of the Lewis & Clark Trail, in a remote, still largely-inaccessible high-mountain terrain characterized by what Lewis called “range after range of impenetrable mountains in every direction.” This portion of the Rocky Mountains is heartbreakingly beautiful. Our fearless guides will take us to such L&C sites as Bears Oil and Roots, Indian Post Office, Lonesome Cove, the Sinque Hole, and Smoking Place. Several times during the day you will find yourself standing in the journal entries of the expedition’s diarists, in places no casual tourist ever visits. This is Greek Spanakopita night, inspired by a “let’s cook for the crew” initiative that Clay insisted upon a few years ago, until the crew said it is just so much easier to do it themselves! After Greek salad, kabobs, and spinach pie, we will climb up Bald Mountain to view as beautiful a sunset as you will ever see. Later, back at camp, dessert and guitar music either by members of the outfitter crew or the kind of spirited crooners we attract on this trip. Because they were explorers, Lewis and Clark could not know just when their troubles in the Bitterroot Mountains would end. When Clark and a few iron men finally punched their way through to the end of the Bitterroots, they rejoiced to see a smooth plateau in the haze to the west. They named this vista “Spirit Revival” ridge. We visit it after breakfast on the last morning of our time in the mountains. The expedition tumbled into a Nez Perce camp, exhausted, malnourished (unlike us) and frightened. The Nez Perce held a formal council to decide whether to assist the poor Anglo refugees or to kill them and get it over with. Thus began one of the best white-Indian friendships in the history of the American West (until 1877, that is). Clay will explain how a Nez Perce woman named Watkuweis saved the expedition, and how the remarkable Nez Perce helped the expedition fashion canoes (at Orofino, ID) and guided them to the Great Falls of the Columbia River. After a final mountain lunch, we will hike down off the mountain. This time it’s more than nine miles, but gravity is on our side for once, and at the end we’ll be greeted by bottles of ice cold water and one of the prime swimming holes in the Lochsa River. For those who have the patience, there are thousands of huckleberry bushes along the trail. After a lodge breakfast, you’ll meet a special guest speaker who will bring a new perspective to our L&C adventure. Often enough, this is the great David Nicandri, occasional guest host on the Thomas Jefferson Hour, or Allen Pinkham, an elder of the Nez Perce Nation. This is a day of leisure and farewell. After lunch you have the afternoon on your own, but almost everyone winds up in the Lochsa River. The day ends with a formal farewell banquet. Clay will tell you that nothing is ever quite the same after you have walked off the map of the known world. Homeward bound. After your last huckleberry breakfast at Lochsa Lodge, a 45-minute ride delivers you to the Missoula International Airport, or to your vehicle at a cooperating hotel. The tour begins in Great Falls, MT and ends in Missoula, MT. 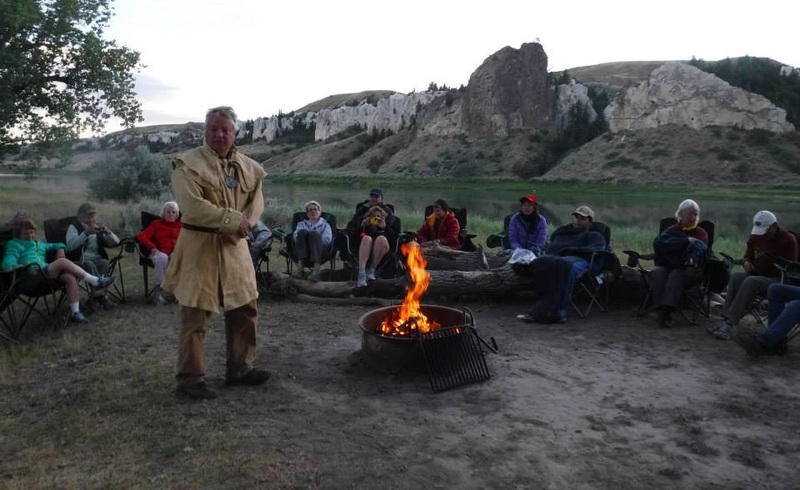 Your tour package includes a week of historical commentary, interpretation, wit, storytelling, and discussion of the meaning of American wilderness led by nationally-acclaimed Jefferson and Lewis & Clark scholar Clay S. Jenkinson. The tour includes an evening with Meriwether Lewis himself, guide services by the finest Montana and Idaho outfitters, all equipment for four nights of camping and canoeing (except sleeping bags), musical entertainment, all activities, lodging, meals, transportation, museum fees, journals to write in, gifts, hotel baggage handling, state and local taxes, USFS fees, and hotel and restaurant gratuities. Airfare is not included. Tour price is per-person based on double occupancy. Traveling alone? No problem. We can easily match you with a roommate. Please inquire about our single supplemental fee of $1,000 if you would prefer a room of your own. Due to our high guide-to-guest ratio, the small group size, with historical interpretation and entertainment by award-winning scholar and sarcast Clay Jenkinson, our tours tend to fill quickly. If it becomes necessary wait-listing is available upon request. We highly recommend you purchase Travel Insurance for your protection in the unexpected event you may need to cancel. Travel Insurance can be provided by your local travel agency or through our office. We hope you can join us! No advance reading is required, but if you want to hit the ground running, here are some books to read about Lewis and Clark in Montana and Idaho. Stephen Ambrose. Undaunted Courage: Meriwether Lewis, Thomas Jefferson, and the Opening of the American West. Donald Jackson. Thomas Jefferson and the Stony Mountains: Exploring the West from Monticello. Clay Jenkinson. The Character of Meriwether Lewis: Explorer in the Wilderness. James Ronda. Lewis and Clark Among the Indians. Gary E. Moulton, ed. The Journals of the Lewis and Clark Expedition, volume IV: April 7-July 27, 1805. Gary E. Moulton, ed. The Lewis and Clark Journals (Abridged Edition): An American Epic of Discovery. (An excellent one-volume distillation of the journals). Donna Kessler. The Making of Sacagawea: A Euro-American Legend. David Nicandri. River of Promise: Lewis and Clark on the Columbia. Ralph S. Space. The Lolo Trail.